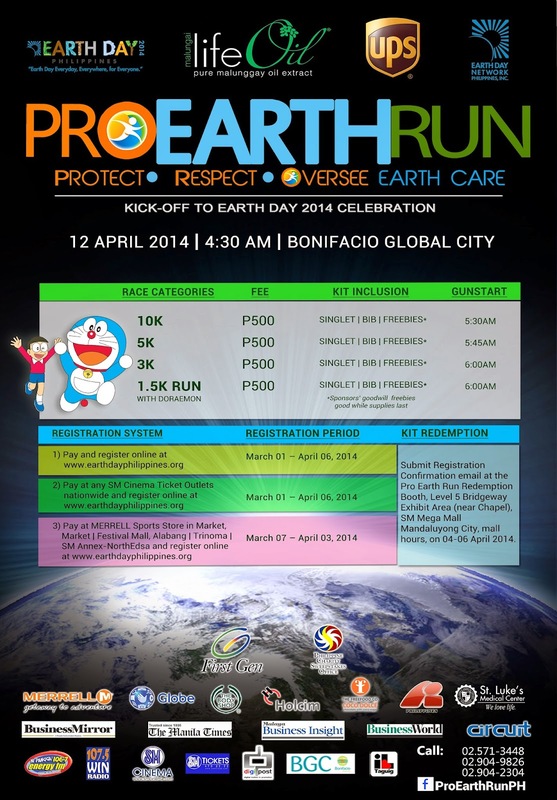 Are you ready to help Mother Earth by taking part of this upcoming Run for a Cause entitled Pro Earth Run? Aside from the abovementioned, 2014 is also equally important for the Network because it is celebrating its 15th anniversary. It was in 1999 that Mr. Mark Dubois of Earth Day International visited the Philippines and helped form the Earth Day Network Philippines in the house of the late Odette Alcantara, the founding Country Coordinator. Since then, the celebration of Earth Day has become truly a dynamic celebration with a meaningful Main Event held in different areas of the country to highlight that Earth Day is Everyday, Everywhere for Everyone. Let's prepare ourselves and get those legs ready for April 12! For more information, you may contact EDNP Secretariat’s Network Relations Officer, Mr. Ryan Alfred Go, at Telefax: (02) 332-6030; Mobile: 0905-5051111; or Email: secretariat@earthdayphilippines.org.